Next generation sequencing is considered a promising novel technology also for the profiling of gene expression. 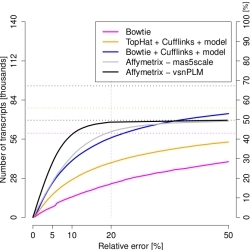 We have performed a first systematic study of RNA-Seq reliability. Measurement precision determines the power of any analysis. Expression estimates for the majority of spliceforms were very noisy, with errors >20%. We have shown that this is a direct consequence of the random sampling of the highly skewed distribution of real gene transcript abundances, independent of the particular sequencing platform and protocol employed. Most of the measurement power is spent on a few strongly expressed transcripts, making the remainder hard to measure. Each doubling of the read depth adds <5% of reliably measured new transcripts. By exploiting gene models already at the alignment stage, we improved the number of reliably assessed spliceforms by 50% (blue curve). Yet standard microarrays performed 20% better (black curve). We therefore recommend and discuss iterative approaches for efficient expression profiling.